Moving forward in her apprenticeship to Skulduggery, Valkyrie Cain (aka Stephanie Edgley) has made great strides, but has a great deal left to learn. Skulduggery's old nemesis, Baron Vengeous and his band of legendary monsters, known as the Grotesquery are determined to release the Faceless Ones and destroy the world. Of course, the oh' so cool, ultra chic, quick-witted wizard stands in their way. Throughout this wonderfully frightening imaginary journey, our heroes must find a way to stop Baron Vengeous' army of monsters from coming fully back to life. Should Valkyrie and Skulduggery fail, the Faceless Ones will return, and the world as they know it will be no more. Will the evil band of hideous baddies defeat the dapper dead wizard and his young apprentice? An intense, exciting adventure that will have even the most reluctant reader on the edge of their seat. While some of the more frightening characters and scenes may be a bit too much for very young readers, their older counterparts will devour the pages. 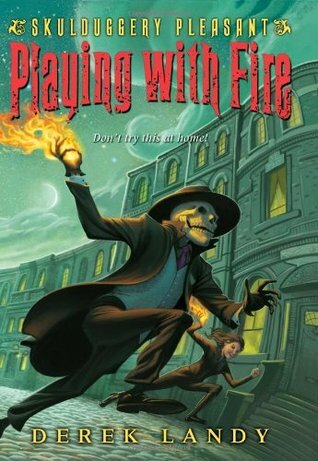 Skulduggery is an ingenious, likable character...strong and heroic but not without fear -- Derek Landy's ability to craft a character that kids can relate too, that is exciting, fun to read and encourages creativity is a noteworthy accomplishment. Allowing the hero to display a fear, albeit an understandable one, that of torture, allows kids to see that even the people they look up to have faults and fears and in today's society this is an important message that flows over into every aspect of life. A fabulous series that seems to get better with each new installment - the book is filled with biting dialogue that propels the action with the speed and intensity of lightning. Four hundred pages, may at first seem a bit much, however, there's no wasted space and never a dull moment. At the conclusion, you will find yourself wishing the book had been four times as long. As the characters grow, the stories expand in depth, allowing the reader to become emotionally invested in the story. From the ultra-cool skeleton to the action and scenery, each has been vividly painted to fully immerse the reader in Skulduggery's world. Although the series was initially penned for ages 10+, these books easily cross all barriers, including age, providing an exciting, entertaining reading experience for all! And this grown-up is hooked - I look forward to the next installment with great anticipation! "A lightning fast 400 page read that in the end you will find yourself wishing the book was four times longer." "What could be more fun than spending a few hours with a dapper, wisecracking, oh so chic dead wizard?